We’ve chosen some stunning fresh flowers in pretty shades of pastel pink, soft lilac, cerise and cream to create this soft bouquet, perfect for Grandparents’ Day. 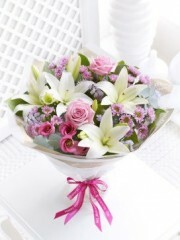 With lilies and roses, as well as a thoughtful selection other beautiful flowers, this gift has plenty to enjoy. Expertly arranged and ready to take pride of place on arrival, this exquisite arrangement of fresh flowers is a wonderful gift for Grandparents’ Day. We’ve selected bright cerise germini and added cool white lilies, delicate lilac September flowers and a single, soft pink rose. Show just how much you care this Grandparents’ Day with this fresh vase arrangement in vibrant shades. 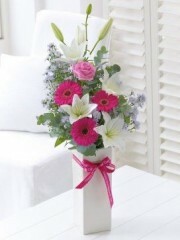 It’s an elegant design in a chic cream vase, so it is ready to display straight away. The Grandparents’ Day ribbon is the perfect finishing touch, and ensures they know just how special they are. This is a bouquet that is bursting with joy and is perfect for Grandparents’ Day. We’ve chosen a selection of flowers in the most vibrant shades of pink, orange and lime – and then hand-tied them to create a beautiful gift they are sure to love. With its pale pink roses, creamy white lilies and beautiful lilac tones, this exquisite basket of fresh flowers is just delightful. The cool pastel shades of the flowers are perfectly complemented by the whitewashed wicker basket. This gift is sure to let them know how much they mean to you, and is one to treasure. 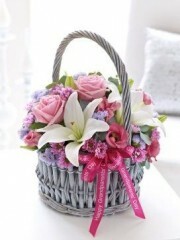 This beautiful basket arrangement makes a charming gift for Grandparents’ Day. 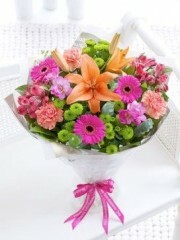 Hot pinks, zingy lime and vibrant orange shades combine to ensure this gift is big on impact. 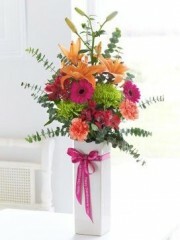 It is sure to brighten their day, and will brighten whichever room they choose to display it in too. Grandparents’ Day is celebrated in a number of countries around the globe including the UK - the first Sunday of October - and the USA - the first Sunday after Labour Day. It is easy to forget about those around us, especially grandparents which is why Edinburgh flowers has a lovely range of flowers perfect for celebrating the lives and achievements of your grandparents. All of the bouquets and arrangements created at Edinburgh flowers are of the best quality as the flowers the florists work with have all been cultivated in the prosperous fields of Holland. Holland is renowned worldwide for cultivating some of the best flowers in world and combined with up to four deliveries per week, not only are our flowers of the best quality but they are also the freshest. This means that your grandparents will be able to enjoy their flowers not only on Grandparents’ Day but for several days after. Up on the Edinburgh flowers website, you can browse through the lovely selection of floral designs the florists have already arranged for this occasion. With over forty years of experience under their belts in the field of floristry, the Edinburgh florists know a thing or two when it comes to your orders so you can be rest assured that your grandparents will receive a bouquet nothing short of perfection. They expertly arrange the flowers to form a dome-like shape with lush foliage and filler flowers to ensure the body of the bouquet is full and not sparse. Once the body of the bouquet has been arranged, the florists wrap up all bouquets in lovely papers, tissues and ribbons or alternatively, if you have ordered an arrangement, the flowers are placed in either a vase, box, basket or even a cute teacup depending on what you’re looking for. Additionally, you can order a hand-tied bouquet which means that the flowers come with a cellophane bubble of water which keeps the flowers hydrated and means that the flowers are easy to take care of. Sometimes all it takes is a lovely bouquet of flowers to show your loved ones that they are thought of which is why Edinburgh flowers has this lovely selection of flowers on offer. If you’re looking for that final finishing touch to accompany your flowers, look no further as Edinburgh flowers also has a gifts range on offer. This gifts range includes scrumptious chocolates, perfect for someone with a sweet tooth; adorable teddy bears; gorgeous smelling candles; fruit baskets in different sizes, full to the brim with sumptuous fruits and balloons. The Edinburgh florists are able to arrange charming balloon bouquets for your grandparents which usually consist of three blank balloons and three with a fitting message for your special occasion. Once your order has been placed, all customers are able to take advantage of one of the flower delivery services on offer at Edinburgh flowers. These services include the standard, next day and same day flower delivery services. All of these are available six days a week Monday to Saturday between 9:00AM and 5:30PM. The next day flower delivery service allows you to place an order the day before it is to be delivered which means that everything is taken care of for you within the space of two days. The same day flower delivery service is handy for those who are perhaps slightly more forgetful with dates than others as it enables you to place an order on the actual day of the delivery. Please note that if you wish to use the same day flower delivery service, your order must be placed before 3PM to give the Edinburgh florists enough time to arrange your orders with the care and attention the flowers deserve. We want our customers to know that once your order has been placed, the Edinburgh flowers team will take care of everything so you are able to focus on those who are most important on this special occasion.